What is the difference between Wire-O and Spiral-O Wire? Wire-O binding and Spiral-O binding are both punch-and-bind methods that work with a twin loop wire binding spine. Also called double loop or double-o binding wires, the only true difference between them is actually the loop or hole spacing. Wire-O is the traditional option; it comes in either a 3:1 or 2:1 pitch hole spacing, which means 3 holes or 2 holes per inch of binding edge. The 3:1 is used for smaller books up to about 120 sheets* and the 2:1 is used for thicker books between about 120 and 260 sheets*. They are compatible with traditional wire binding machines. Wire-O binding spines are available in sizes from 1/4" to 1 ¼", so can bind up to about a 1 ⅛" thick book. They are available in 10 stocked colors, including black, white, silver, pewter, blue, navy, gray, green, gold, and red. Spiral-O wire, however, was manufactured to fit into the same hole spacing as a plastic binding comb (sometimes called a GBC comb). 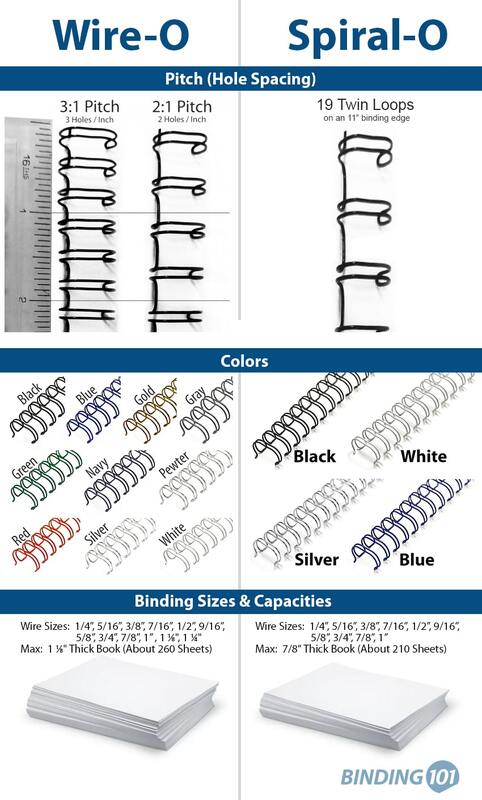 This gave users with a plastic comb binding machine the opportunity to also wire bind (just add a wire closer to finish the books) essentially doubling their binding capabilities and options. Spiral-O binding spines are available in sizes from 1/4" to 1", so the capacities are more limited than Wire-O, allowing for binding a book up to about 7/8" thick. They are stocked in 4 colors, including black, white, silver, and blue. *Based on 20 lb. bond copy paper. May vary depending on paper stock, book thickness, operator, and other factors.